Just started a new book that I have read a while ago. It touches at the heart of our Marianist community life. Each and every day we attempt to build this Gospel community that is the essential core of our lives. Our vowed life in the Church focuses on the two tables; the table of the Eucharist and the table of community. Everyone these days seems to be searching for community in one way or another - whether in the form of committed, nourishing relationships at home and at work, support networks, small groups, house churches - even cyberspace. But mention "community" and many people literally go blank. They claim that they're not ready for the commitment such a term implies, or lack sufficient energy, gifts, or time. It's just not 'where they're at.' Or is it? This new translation of a time-honored manifesto adds a fresh, engaging voice to the vital discussion of what real community is all about: love, joy, unity, and the great "adventure of faith" shared with others along the way. 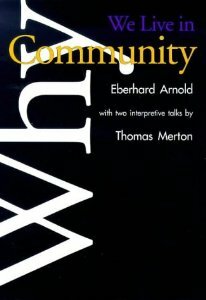 Neither Arnold nor Merton describe (or prescribe) community here, but for the individual seeker, they do provide a vision to guide and inspire the search, and for those who may have already answered the call to community, they offer the disarming challenge of greater commitment and a continually deepened faith.